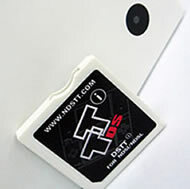 blank DSTT DSi cart for playing NDS ROMs on DS Lite and DSi XL from micro SDHC Flash card. When DSi came to the market, a lot of people raved about its “Wii-esque” touch. Unfortunately, just as many people ranted about how it made the previous DS and DS lite-compatible flash cards totally unusable. To remedy this issue, the DSSTi came to life, and Nintendo gamers all over the world rejoiced. And with good reason, too, since the DSSTi card stayed true to its predecessor's characteristics – particularly its being user-friendly and its speed when launching a game. 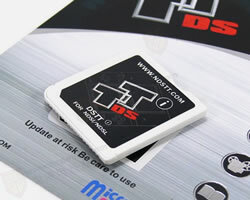 DSSTi supports plug and play, as well as drag and drop of files from PC to memory card. It is also Micro SDHC compatible. It automatically detects and generates the save type, and it saves directly to the card instead of the onboard chip, so you can be sure your game saves are alright. Just like other so-called 'advanced' flash cards, it supports action replay and it has a cheat code engine. User interface is also skinnable and easy to use. It supports both touch screen and button operation and has the soft reset feature as well. It likewise supports download play and WiFi. As mentioned, DSSTi is fairly user-friendly. It is easy to install and the interface allows for fast access to saved games. It can work against advanced users though, as they might want to have fast access to files other than what they regularly use. There are virtually no problems when it comes to compatibility which makes this flash card one home brew download heavyweight. Some people complain, though, that it does not come bundled with an SDHC reader although it is SDHC compatible. However, for the most part, it has delivered the promises of its makers. The DSSTi's best selling point would be its relative ease of use characteristic. Installation is no-fuss as well. It also has an attractive graphic user interface that is easily skinnable. It has an excellent hardware design and the card looks like it was really made for the DSi, which it is. Homebrew compatibility is also good, thanks to the excellent homebrew operating system. The problem with DSSTi is that while it has decent compatibility ratings, it isn't completely homebrew compatible. This is an issue since these days flash cards are expected to be 100% compatible. The graphic user interface also allows no file sorting. Things could perhaps be better if gamers can hear a promise of sorts from the DSST team that they would work on the flaws, but at the moment, it seems like they’d just have to bear with the device for a while. Having put DSSTi through the famous ringer, we can safely say that it is a good flash card in its price range and that it does the job just fine. If you want more than your usual dose of Nintendo gaming, though, you might want a more advanced flash card. But if you are a newbie who doesn't want much fuss and wants good old fun, then this DSi flash card is perfect for you. DSTT is better known for its SDHC compatibility but it is now faced with the challenge of fighting its clones that are already available in the market. The packages of these imitated DSTTs really look almost similar to those of the original DSTT except that some clone manufacturers named these clones as CN-DSTT or DSTT-ADV. There are even clones that bravely use the DSTT brand name even if they are not affiliated in any way to the DSTT developers. In an action to counter these clones in stores right now, DSTT web sites now contain articles on how to recognize clones and fakes of DSTTs. DSTT and DSTTi are compatible with homebrew games and ROM software but their pleasure is derived more from the fact that they have a massive cheat support feature on many games that are played on them. Foreseen developments for 2010 are reported to include DSTTi working with DSi XL in March of the said year.